Jambon de Bosses DOP is a raw ham cured meat spiced with mountain herbs from northern Italy. Jambon de Bosses DOP is produced at an altitude of 1600 meters in the location for which it is named, Saint-Rhémy-en-Bosses, situated in the Gran San Bernardo Valley, at the edge of the Swiss border in Valle D’Aosta. The dry climate, exposition and winds from the hills of Malatra, Citrin, Serena and Gran San Bernardo mountains, create the ideal environment for its production. The predominant taste is sweet and delicate with hints of salt and spice. 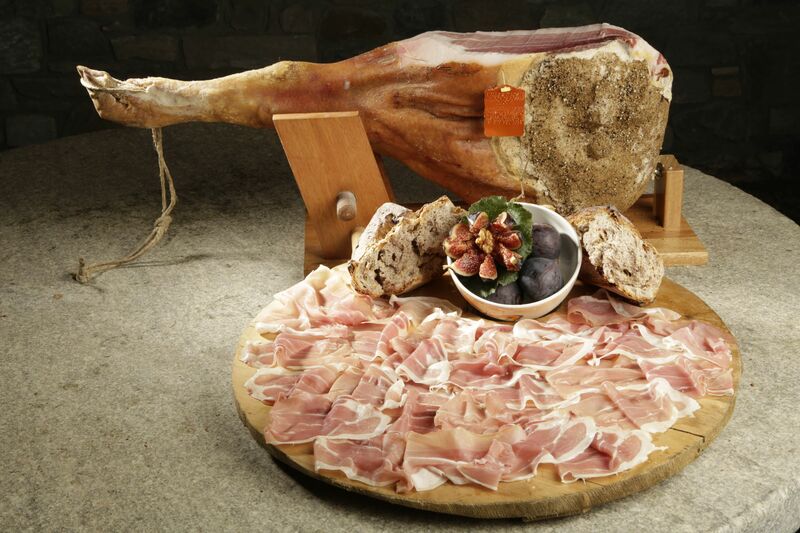 Jambon de Bosses can be eaten on its own or with local cheeses, such as Fontina DOP or Fromadzo DOP. It is also perfect with appetizers with fruit and vegetables or with a good glass of Alto Adige Pinot Nero DOC.